Founded in 1879, the Royal Ulster Academy is the largest and longest established body of practicing visual artists in Northern Ireland. One of the founding principles of the Academy was to hold an annual exhibition of work by both members and non–members of merit. Now in its 137th year, this event remains one of the highlights of the Northern Irish arts calendar. The 137th Annual Exhibition will run at the Ulster Museum, Belfast from 19th October 2018 to 6th January 2019 and has once again been sponsored generously by KPMG. 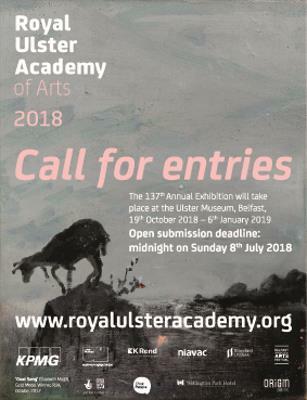 The Royal Ulster academy welcomes submissions across the disciplines of the visual arts by emerging and established artists. Initial Submissions should be made online. The deadline for Open Submissions to the exhibition is Sunday 8th July 2018.